-Remove the casing from 4 lean Italian sausage links and brown in a bit of extra virgin olive oil. -Season with a bit of salt and about a tsp each of freshly ground fennel seeds and ground sage. -When fully cooked and browned, add 1 TB of unsalted butter and a few handfuls of frozen peas. Toss. 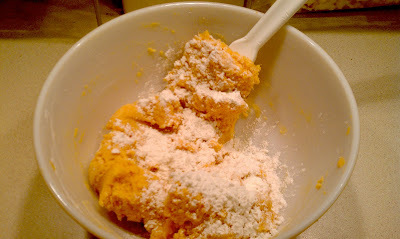 -Check your seasoning and add more salt if needed, but keep in mind that the cheese you will be adding is salty. 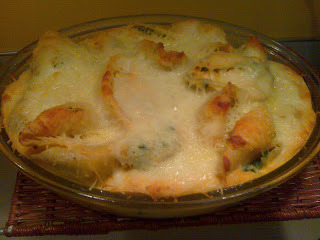 -Plate your dish and sprinkle with a good amount of grated Asiago cheese and a handful of fresh chopped sage leaves. -Grate some fresh nutmeg over the plate and enjoy. I made these sweet potato gnocchi as part of my Thanksgiving dinner last year. I served them with a brown butter-sage sauce and they were delicious. They were also very ugly. I made the mistake of not using a big enough pot to boil them in and was in such a frazzled hurry to finish dinner that I poured my entire large batch into a not-so-large pot of boiling water. They just clumped together and became one big, mushy mess. I come from the school of making do with whatever mistake you make in the kitchen, so I just removed my big, gnocchi clump from the water and placed it in the sauce and served it anyway. It tasted really good as long as you closed your eyes. I had intended on serving these again for my family this year, but we’ve decided to spend Thanksgiving with my husband’s parents in South Carolina so I won’t be doing as much cooking. I couldn’t live without making them again, (I was also determined to not mess them up this time), so I thought today would be a great day to do it. I received some good help from my son making these gnocchi. He loves making anything with me that involves stirring, mixing, kneading, measuring, shaping…OK, it’s safe to say he loves making everything with me. He is an excellent dough handler and was a big help in shaping these beautiful, delicious pillows of goodness. –Run your cooked, peeled sweet potatoes through a food mill or ricer into a large bowl. 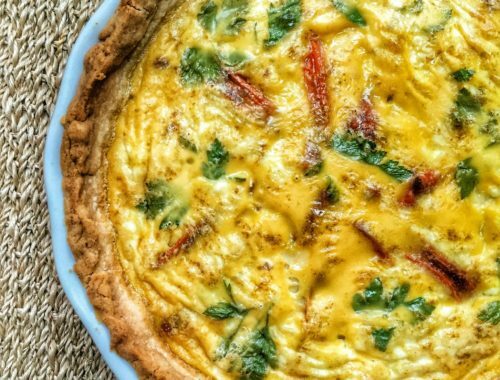 –Add your egg yolks and lightly mix until the yolks have broken up and moistened the potatoes. 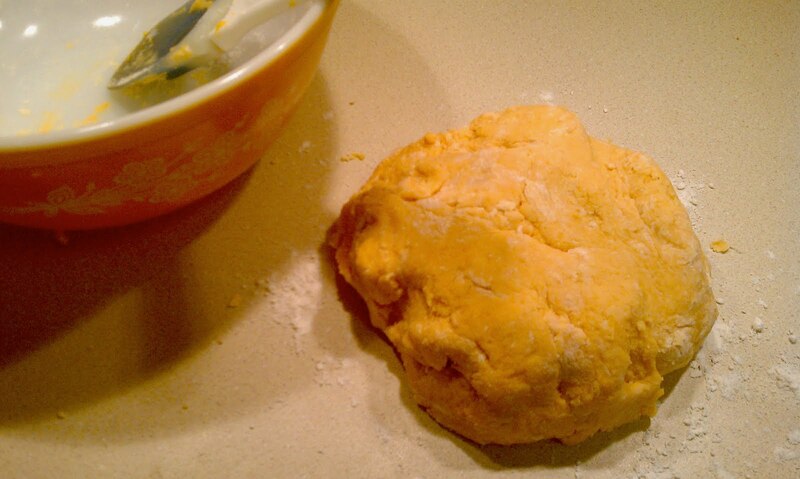 –Gradually add in your flour, and gently stir with a spatula until the mixture begins to resemble a dough. –When you get to the point where the dough isn’t very sticky anymore, turn it onto a floured surface and knead it with as much flour as needed to make it not stick to your fingers. –Separate the dough into 4 sections. –With the help of some more flour, shape each section into long, skinny rolls, twice the thickness of your finger. 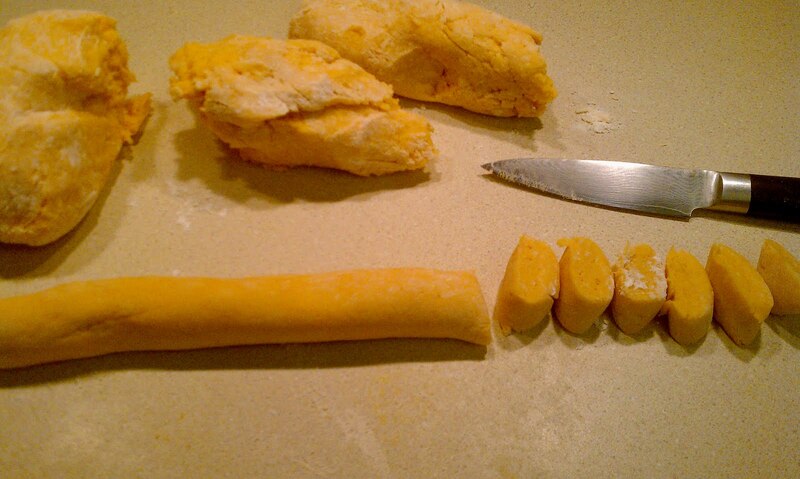 –With a floured, sharp knife, slice the rolls into 1-1 1/2 inch chunks. 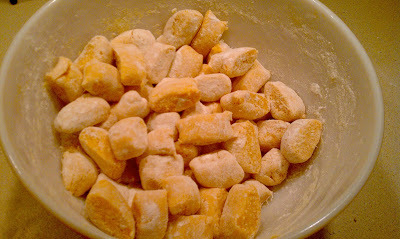 –Place the gnocchi back into the original mixing bowl with some flour to lightly coat the gnocchi. Each time you add another batch of gnocchi to the bowl, add a bit more flour and lightly toss the bowl to coat all the pieces so they don’t stick to each other. –When you cook these, make sure you either boil them in batches in a smaller pot or use a really big pot so you don’t end up with a messy clump. I actually dropped them in my big pot one at a time tonight because I was so paranoid! You know when gnocchi are finished cooking when they begin to rise to the top of the pot. Feel free to serve these gnocchi however you’d like, they’re delicious simply sauced with a bit of melted butter, nutmeg and orange zest or you can do what we did tonight. However you have them, just make sure you have them. What do I get when it’s Santa’s birthday? And other questions that keep me up at night. Abbey, your gnocchi looks so very tempting! Now, you made me cravy for it again. haha…. Thank you for sharing and hope you're having a great day ahead. Oh thanks Kristy! I've been wanting to make these again for a year and am fully satisfied with the results this time! 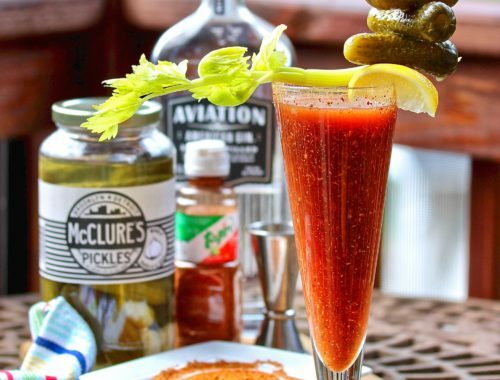 Well looks like you didn't have to close your eyes this time to eat it…it looks really good! Ha! Thanks Bo, it was definitely an improvement! 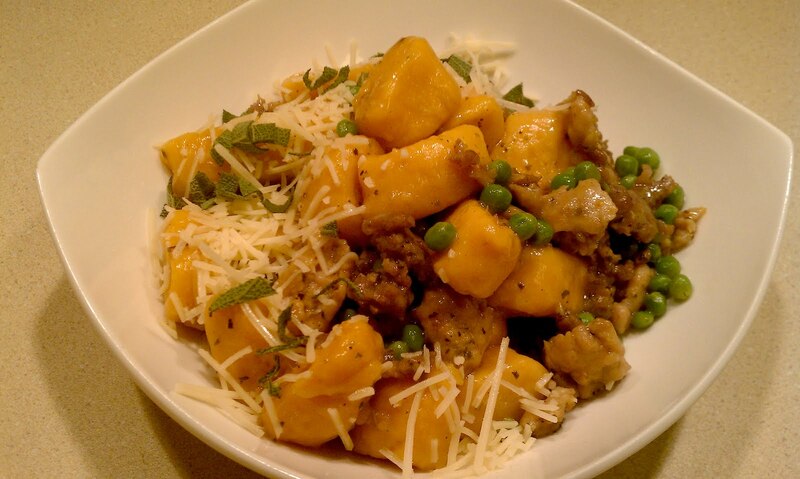 Ummm…I made pumpkin gnocchi the other day, but for some reason I am craving parm cheese with it! Your dish looks so good…I forked mine, oh that sounds funny doesn't it! I have been avoiding trying to make gnocchi for years because I have such a heavy hand–but I think you might just have persuaded me. By the way, several sweet potato associations offer annual prizes for recipes; I think you should enter this in one! That's so sweet about the recipe contest..I'll look into that, thanks!